4/14 Cup of Coffee: The Red Sox affiliates got some strong starting pitching on Thursday night, though they got little support from their lineups. 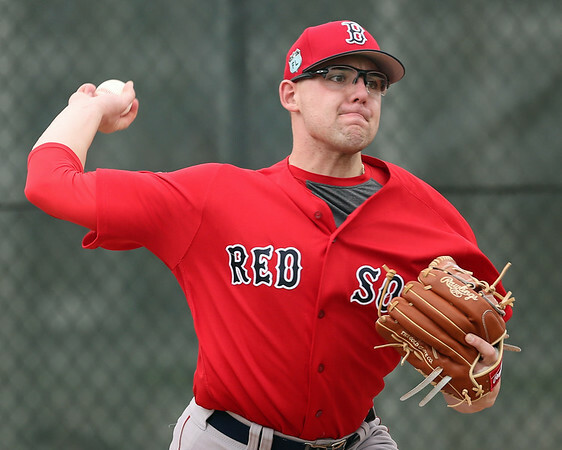 Greenville's Mike Shawaryn (pictured) bounced back from a very rough 2017 debut by throwing five innings of one-hit ball, while Brian Johnson and Daniel McGrath were nearly as dominant for Pawtucket and Salem. Brian Johnson left his first start of the season in the fifth after being struck in the head with a comebacker. Five days later he showed no ill after-effects, turning in 6 2/3 innings and allowing only a run on four hits. The left-hander struck out eight while walking one. Not to be outdone by his fellow 2012 first-round pick, Deven Marrero delivered the decisive hit with two outs in the bottom of the ninth, driving home Matt Dominguez. Brandon Workman earned the win in relief, striking out four in 2 1/3 hitless frames. Rusney Castillo had his third consecutive multi-hit game, going 2 for 4 with a run scored. At previous steps up the ladder, Rafael Devers had undergone a transition before eventually making adjustments and dominating. It's still quite early, but the 20-year-old phenom hasn't had any such adjustment period in Double-A. Devers was 3 for 4 with a double and two RBI on Thursday, and he's now 10 for 25 with four extra-base hits in his first six games, good for a robust 1.040 OPS. Jalen Beeks got the start for the Sea Dogs, allowing five runs in 3 2/3, striking out seven. Taylor Grover and Luis Ysla combined for 4 1/3 innings without surrendering an earned run, but the Portland bats could not dig out of the early hole. Daniel McGrath was one of three starters in the system to allow one or fewer runs and come away with a no decision to show for it. McGrath gave up the one run on only two hits in six frames, striking out five. The Salem lineup didn't offer much support, posting only four hits and none for extra bases. Josh Ockimey delivered one of those hits, bringing his batting average through seven games to .433. Five days after Mike Shawaryn gave up nine runs to kick off his first full pro campaign, the 2016 fifth-round pick gave up just one hit in five shutout innings. He struck out eight and walked one, but came away with a no-decision as Asheville rallied to win in extra innings. Jordan Weems was charged with a blown save despite an overall effective outing, giving up a run on two hits in three innings, and striking out a pair without walking a batter. At the plate, Bobby Dalbec was 1 for 3 with a walk, while Tyler Hill delivered a pair of hits. Player of the Day: Following a strong pro debut last season, expectations where high entering 2017 for Mike Shawaryn. The former Maryland Terrapin gave a glimpse into why on Thursday night, striking out eight in five innings without allowing a batter to reach second base. The most recent SoxProspects podcast went in depth both on what to watch for from the right-hander on the mound and how to pronounce his name correctly.